Who was Anna Maria Celicia Thomsen Meyer? Anna Maria Cecialia Thomsen Meyer was christened on April 15, 1860 in Ullerup, Aaberra-Sonderborg, Denmark. She was the fifth child of Thomas Thomsen and Anna Maria Brok or Brock and their third daughter. She joined a brother Hans Jorgen (John) age 6, sister, Kristine age 4, brother, Thomas age 3 and a sister Katherine (Kate) age 2. It isn’t hard to imagine her addition made an already busy household even busier. None of her siblings were old enough to be much help. 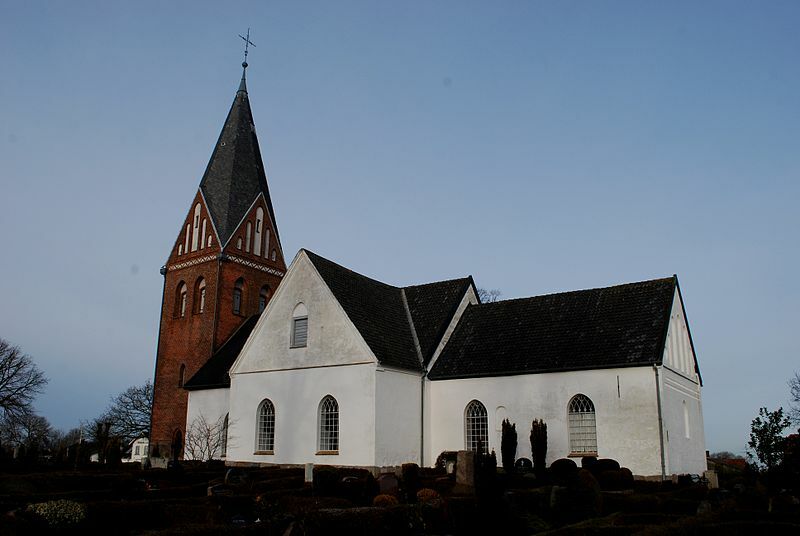 Photo of Ullerup church where Anna or Mary as she became to be known in the United States was likely baptized. Below is another photo of Ullerup. It looks a lot like Wisconsin doesn’t it? . When Mary was only 4 years old the Prussian army marched in and took over the Schleiswig and Holstein areas of Denmark. Ullerup was part of Schlieswig. She and her family probably saw and put up with Prussian soldiers in their village that year. My Grandma Rose left some brief notes about this family in a notebook my mother came to have. Mostly she had used the notebook for household hints and things of that nature but near the end she had written down my Grandpa George’s, Mother’s family. Although Rose made no mention of his name the 1880 census does show a son named Peter who would have been born in 1865. The youngest son Christian was born in 1870. Since the census records for Christian shows him born in Denmark the family must have emigrated after that date. According the notes my Grandma Rose Meyer wrote down, Thomas and Anna did not want their sons to serve in the Prussian army and so the father immigrated with the sons first with the women following later. This also fits with the story my Mom frequently told us with regard to the Thomsen family. Mary’s eldest brother would have been of conscription age about 1874. So they most likely immigrated about that time. My Grandma Rose wrote that the eldest daughter Kristine was ill and would not have passed the health inspection and was left behind with relatives. Whether this is true or not can’t be verified but Kristine would have been around 18 or 19 when they left so perhaps she elected to stay behind. From the Danish parish records I was able to find that she did marry in 1883 to a Christian Bruhn, had 2 children, one of who was still alive when she died on Nov. 28th of 1885. Thus far I have been unable to find any of the family in immigration records. In the 1900, 1910 and 1920 census Mary gives three different years for her immigration being 1871, 1872 and 1875. Sister Kate gives her immigration date as 1879 in both the 1900 and 1910 census. Christian gives the date as 1874 and 1875 in the various census records. And Mary’s obituary says she came at age 16. I can find no positive proof for the eldest son in Wisconsin (his name would translate to John which is too common of a name to identify without having something more to go on) He is not in with the family in the 1880 census nor is someone with that name shown in Cascade or nearby areas. My mother remembered that her grandmother said she arrived in the U.S. as a teen and had to work in the fields etc. to help the family support itself. Whatever the date it had to be between 1871 and 1879 as the family is found in Cascade, WI in the 1880 census records. At that time Mary is living and working as a servant in the town hotel. Near the hotel was John Meyer’s shoe shop. In1881 the couple married. They had four sons, William b. in 1882, Frank Charles in 1883, George in 1888 and Arno in 1893. My mother recalled that she was a stern woman. She said she had to be for her boys were full of mischief and got themselves into lots of trouble. She recalled hearing them tell about times when they put farmers wagons on top of their roofs as Halloween pranks. She also recalled she was strict Lutheran. My Mother also remembered her as an excellent cook. After her husband died in 1926 she stopped taking good care of herself so the family helped her move to a home in Milwaukee. From my Mom’s description of it, it sounds a lot like the retirement living places of today. She had her own room with her special things and ate meals in a dining room. She still frequently visited friends and families homes. My Mother recalled her coming to stay at the farm often. When my Mom went to stay at her Aunt Camilla’s and Uncle Frank’s in Milwaukee she would go to visit with her grandmother. She remembered that she usually had some small trinket to give her and liked to show her off to her friends at the home. Eventually Mary’s health failed and she went to a nursing home where she died in 1941.Her obituary in the Sheboygan Falls newspaper described her as a kind thoughtful person who liked people and had a friendly disposition. She was survived by 3 sons and her brother Christian who lived in NJ. She was a loyal member of St. Paul’s Lutheran church in Cascade and St. Mark’s Lutheran church in Milwaukee. She is buried at St. Paul’s cemetery in Cascade, Wisconsin along with her husband and infant son William. This entry was posted in Uncategorized and tagged Anna Maria Brok, Anna Maria Cecialia Thomsen Meyer, census records, Christian Bruhn, Grandma Rose, Thomas Thomsen on June 2, 2014 by kwriter13.